Quartz is the most common material on the continental crust. Quartz countertops are a man-made surface combining natural quartz mixed with a binding resin and colored dyes. This process forms a very hard and durable surface that is similar to granite in look, feel and performance. Since it technically isn’t 100% stone, it is often referred to as “engineered” quartz. However, this is definitely not a synthetic countertop. In fact, quartz is the hardest non-precious stone that can be found in the earth's surface. Color options for quartz countertops are virtually unlimited. Besides being beautiful in the kitchen or bath, quartz countertops are eco friendly, scratch resistant and durable. They’re easy to maintain and there's no need for special cleaners. The non-porous quality of the surfaces means they don’t need to be sealed. Also the potential for bacterial growth is reduced. CaesarStone is an engineered stone that is made from 93% quartz and 7% resins and pigments. 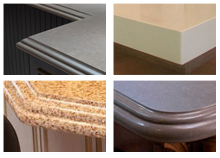 Polymer additives increase strength and countertop life. CaesarStone has earned the respected Good Housekeeping Seal of Approval; is consciously manufactured toward efficiency, earning it the top rating in the green building field; and CaesarStone countertops meet sanitary standards for use in restaurants, hotels, hospitals and other institutions. Primarily used for kitchen countertops and bathroom vanities, the surfaces come in collections of more than 70 colors, textures and finishes. CaesarStone® can be sized and molded to a very wide range of specifications. The flexibility to isolate pigments lets the manufacturer create a diverse range of incredibly consistent solid tones, as well as distinctive veined color schemes, blends, speckles or other patterns; with options ranging from traditional to contemporary. Eco friendly and seamless, CaesarStone’s non-porous nature provides maximum resistance to staining and fully eliminates the need for any sealing. CaesarStone countertops are easy to clean using a non abrasive cleaner. The non-porous quality of the surface also greatly reduces the potential for bacterial growth. CaesarStone is covered by a limited lifetime warranty. Made in the U.S., Cambria is a natural stone surface that is elegant and practical with a sleek finish that resists scratching and other damage. Cambria is the only American company that produces quartz countertops. Cambria comes in a dazzling array of colors to match virtually any kitchen or bath décor. From Snowdon White to Bristol Blue and Flint Black, each color offers not only a unique range of hues, but distinctive blends of colors and natural quartz stone. If you have a specific color scheme, pigment is added to the raw material to create the color that complements your surroundings. Cambria's Quarry Collection™ offers a variety of warm, rich tones that capture the beauty and mystique of random variation found in natural quartz stone. Once the slabs are polished, the quartz crystals that make up the structure of this beautiful natural material are visible throughout the countertops. Cambria offers superior sanitary properties, is GREENGUARD certified for Children and Schools, as well as for Indoor Air Quality; and has also been certified by NSF International as safe for use as a food preparation surface. Since it is non-porous, Cambria countertops resist stains from food items such as wine, coffee and tea. No sealing is needed and countertops are easy to clean and care for. Simply wash with warm water to maintain their natural luster and shine. Since Cambria is a natural surface, it can be damaged by direct heat. When placing hot pots and pans from your stove to your countertop, always use a hot pad or trivet to avoid any damage to your countertop. Cambria is covered with a limited lifetime guarantee. Silestone is a natural quartz surface that looks, feels and weighs like granite, but with a shimmering uniqueness because of quartz crystals that are embedded into the material. The natural quartz in Silestone radiates depth, dazzling clarity and the cool, solid feel that is unique to natural stone. Silestone adds sophisticated elegance and timeless beauty to practically any surfacing in the home. It is a perfect choice for kitchen countertops, bathroom vanities, backsplashes, tabletops and more. Its uniformity and consistency allows for virtually unlimited edge designs. Silestone is available in a large spectrum of striking colors, with variations in shade and texture. The series’ include traditional neutral hues, bold vibrant colors and luxurious Silestone leather. Since Silestone countertops are non-porous, they don’t need sealing and you don’t have to worry about spills from wine, coffee, citrus juices, coffee, vinegar bases, and many other common household products. 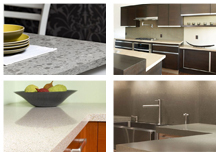 Silestone countertops are durable and virtually maintenance-free. To clean your countertops simply wipe them down using a mild household cleaner or soap and water. Silestone is scratch resistant, stain resistant and scorch resistant. The fire of a lit match will not scorch Silestone. However, don’t place crock pots and electric fry pans directly onto your countertop. As with hot pots and pans, trivets are always recommended. Silestone offers the unique combination of built-in Microban antimicrobial product protection (inhibits the growth of microbes such as odor-causing bacteria, mold and mildew), National Sanitation Foundation certification and GREENGUARD indoor air quality certification, and comes with a 15 year warranty. Vetrazzo begins with you. When you dispose of your glass bottles into your curbside recycling bin, it ends up at a facility where it is processed by color and glass type. Once sorted, it's crushed and packaged for companies like Vetrazzo to purchase for reuse. We look for interesting colors and also source from post-industrial glass sources and demolition sites to get an array of options for making slabs.